One of them tracks the data in excel so I added a purely data line in text to the bottom of the email so he can just copy and paste it into excel. I used \t (tabs) to denote fields but when I paste, it all runs together. Is there a character to put in each field in a cell in excel? You can use anything you want that doesn't appear in your data. A popular choice is either "," or "|". When you paste in your data there should be a little box that appears in the lower right of what you just pasted, and you can use that to modify how the data was imported, otherwise you can just use Data-> Text to columns. 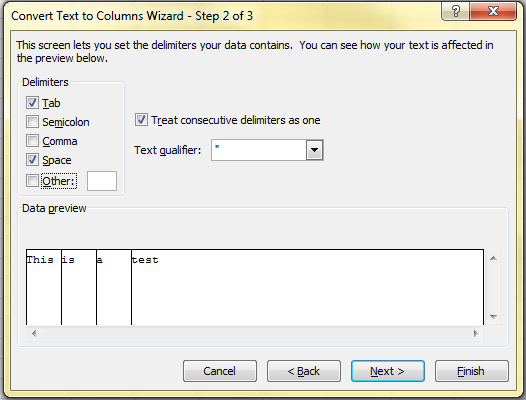 Then select deliminator, then type in the deliminator you want to use. "This is a test" will convert each word to a cell. "This:is:a:test" will also, but you have to tell excel that the symbol is the colon. Are you creating your message in HTML? Tabs generally get replaced with spaces in HTML messages. Try creating your e-mail in plain text format and the tabs should be retained and you'll get the expected behaviour when pasting into Excel. Not the answer you're looking for? Browse other questions tagged microsoft-excel conversion copy-paste cells or ask your own question. Convent a text file into an Excel column of cells, each cell with a variable number of text lines? How do I copy-paste from Excel with TAB?